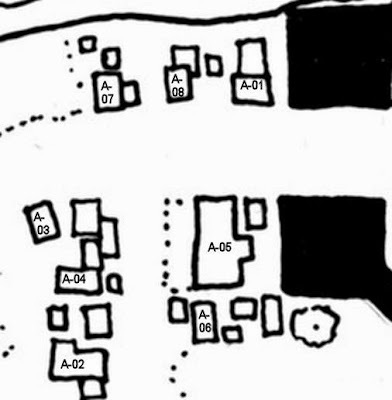 This in the first post detailing the City of Alderbridge. While I should be naming streets, planning the city government, and all that background stuff, what I wanyted to do was create some buildings. So I decided to detail part of the area just outside the west gate (just south of the river, see the main Alderbridge map). As this is outside the city walls I don’t need to decide all the details of the city yet. However, just from reading these descriptions, you can see some hints. References to the Twins and the Underlord, for example. The Twins are the twin high level mages who rule the city. The Underlord is a shadowy crime lord who wants to be so much more. The tax on entering the city is apparently high enough for non-residents that many counting their coins closely try to avoid doing so. On with the local map and the building descriptions. Note I am using descending AC and the nine-axis alignment system for these buildings. This may change after more thought. The Alligator is a tavern marked by a stuffed alligator hanging over the door. Sallie is a retired city guard whose still retains much of her youthful beauty. Gusten is ugly by comparison but cooks great but simple fare. The Alligator is infamous for Alligator Piss, a cheap drink always served hot (1 cp a mug), and its gator stew (2 cp a bowl). Neither have a bit of alligator in them although everyone believes they do. The Alligator is popular with adventurers, caravan guards, and other visitors who don’t want to enter the city walls. Staff: 4 slaves (HP: 2) and 3 serving wenches (HP: 2). Rumors: Sallie retains her beauty by bathing in alligator blood. The Green Snake Inn attracts adventurers, caravan guards, minor merchants, and other travelers. It’s a popular place with 6d6 of its 40 rooms filled every night. Rooms can hold up to 4 people (5 sp/person/night). Basement bunkroom holds up to 40 people (1 sp/person/night). 12 servants (HP: 3) provide room service. The Green Snake does not provide meals, but common grog is available for 1 sp a glass in the common room. Whim is a former adventurer who lost two fingers from his left hand to an owlbear. Rumors: The Lord Mayor is Whim’s cousin. Haddith shoes horses, repairs weapons, and does other general blacksmithing chores. His work is average but he is fast and cheap (20% below stand costs). He hates orcs and will not serve an orc or anyone he believes is friendly with orcs. Rumors: Swords will soon require a license inside the city walls. Marcel supplies provisions to caravans, adventurers and other travelers. Prices for rational and hard rations are normal. 10% chance 1d20 loaves Elven Weybread available. He supplies information on caravans to bandits for a 1% cut of the take. Matt and Dona and their large staff (15-25 depending on season) supply everything from entire caravans to lone travelers with any goods that can be found for sale in the city. For a markup of 5 to 25 percent (depending on order size and speed at which it must be fulfilled), they will take a list of goods needed and send their staff into the city to purchase them and bring them to their warehouse for pickup. For an extra fee their staff can pack them as needed for their clients. Their main customers are caravans, but those who need to obtain items anonymously from within the city are a profitable sideline. Dona usually deals with clients and money while Matt handles the actual gathering of materials ordered. Rumors: Bandit activity to the north is much higher than normal. Orcs will be driven out of the city. Gate taxes will be raised. Ted and his two apprentices sell everyday potions (medicine, cleaning jokes, etc.) at reasonable prices. They also buy and sell potion ingredients and sell potion creation supplies — the latter at a good markup. Nadali appears to be CG but is actually CE. She has secret plans to eventually kill her master and inherit his shop. Rumors: Prostitutes at Greta’s Girls are upset over new owners of the business. Thanks to war injuries, Lucky is the ugliest dwarf you may ever meet. Despite his ill luck at war, he is very lucky at games of chance. He runs a small but popular gambling establishment. The stakes are never very high, but the games his staff runs are fair (but the house odds average 10%). Rumors: Lucky once beat the Twins at dice and has lived outside the gate ever since. Dwarves in the pay of the Underlord are planning a coup.